Haut-Rhin is a department in the Grand Est region of France, named after the Rhine river that flows along its eastern border. Its name means Upper Rhine. The prefecture (capital) of Haut-Rhin is Colmar. Haut-Rhin is one of the original 83 departments created during the French Revolution on 4 March 1790. It was divided in three districts: Altkirch, Belfort and Colmar, with Colmar as is capital. In 1800, with the creation of the arrondissements in France, the three districts were changed into five arrondissements: Colmar, Altkirch, Belfort, Delémont and Porrentruy. The arrondissements Delémont and Porrentruy were eliminated in 1814 and transferred to Switzerland. The subprefecture of Altkirch was moved to Mulhouse in 1857. The Haut-Rhin department was eliminated in 1871 when the territory became part of Germany except for a part that forms the Territoire de Belfort. In 1919, Haut-Rhin is again an department when the territory became part of France with the arrondissements Colmar-Ville, Colmar-Campagne, Altkirch, Guebwiller, Mulhouse, Ribeauvillé and Thann. Its capital is Colmar. The arrondissements Colmar-Ville and Colmar-Campagne were combined in 1934 to form the arrondissement of Colmar. In 2015, the arrondissements of Guebwiller and Ribeauvillé were eliminated and the name of the arrondissements of Thann and Colmar were changed to Thann-Guebwiller and Colmar-Ribeauvillé. To the east, the department borders Germany along the Rhine river, and to the south it borders with Switzerland. Haut-Rhin has an area of 3,525.2 km2 (1,361 sq mi). 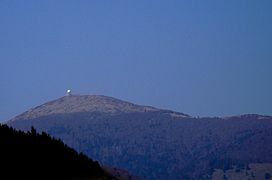 Its highest point is Grand Ballon (47°54′4″N 7°5′54″E﻿ / ﻿47.90111°N 7.09833°E﻿ / 47.90111; 7.09833﻿ (Grand Ballon)) in the Vosges Mountains, in the eastern part of the department; it is 1,424 m (4,672 ft) high.. The lowest point is 179 m (587 ft) high along the Rhine river. The area around Colmar, at an altitude of about 210 m (690 ft), is characterized by climates with few extremes of temperature. The Köppen climate classification type for the climate at Strasbourg is a "Marine West Coast Climate" and of the subtype "Cfb". The average amount of precipitation for the year in Strasbourg is 594.4 mm (23.4 in). The month with the most precipitation on average is June with 71.1 mm (2.8 in) of precipitation. The month with the least precipitation on average is February with an average of 33 mm (1.3 in). The average temperature for the year in Strasbourg is 10 °C (50 °F). The warmest month, on average, is July with an average temperature of 18.9 °C (66.0 °F). The coolest month on average is January, with an average temperature of 1.1 °C (34.0 °F). Haut-Rhin is managed by the Departmental Council of Haut-Rhin in Colmar. The department is part of the Grand Est region. There are 4 arrondissements (districts), 17 cantons and 366 communes (municipalities) in Haut-Rhin. Haut-Rhin had a population, in 2014, of 760,134, for a population density of 215.6 inhabitants/km2. The arrondissement of Mulhouse, with 350,032 inhabitants, is the arrondissement with more inhabitants. The Grand Ballon, southern side. ↑ "Vos élus" (in French). Conseil départamental du Haut-Rhin. Retrieved 14 December 2017. ↑ 2.0 2.1 "Département du Haut-Rhin (68)". Comparateur de territoire (in French). Institut national de la statistique et des études économiques - INSEE. Retrieved 14 December 2017. ↑ 3.0 3.1 "Populations légales 2014 des départements et des collectivités d'outre-mer" (in French). Institut national de la statistique et des études économiques - INSEE. Retrieved 14 December 2017. ↑ 4.0 4.1 4.2 "Historique du Haut-Rhin". Le SPLAF (in French). Retrieved 13 December 2017. ↑ "Grand Ballon, France". Peakbagger.com. Retrieved 14 December 2017. ↑ "Colmar, France - Köppen Climate Classification". Weatherbase. Retrieved 14 December 2017. ↑ "Département du Haut-Rhin (68)" (in French). Institut national de la statistique et des études économiques - INSEE. Retrieved 14 December 2017. ↑ 8.0 8.1 "Régions, départements, arrondissements, cantons et communes" (PDF). Populations légales 2014 (in French). Institut national de la statistique et des études économiques - INSEE. Retrieved 14 December 2017. ↑ 9.0 9.1 "Département du Haut-Rhin (67) et Arrondissements". Comparateur de territoire (in French). Institut national de la statistique et des études économiques - INSEE. Retrieved 14 December 2017. ↑ "Décret n° 2014-207 du 21 février 2014 portant délimitation des cantons dans le département du Haut-Rhin" (in French). Légifrance.gouv.fr. Retrieved 14 December 2017. ↑ "Habitants du départment: Haut-Rhin" (in French). habitants.fr. Retrieved 14 December 2017. Wikimedia Commons has media related to Haut-Rhin. This page was last changed on 6 September 2018, at 09:09.